Adams captured in Rochester, NY in 2012. 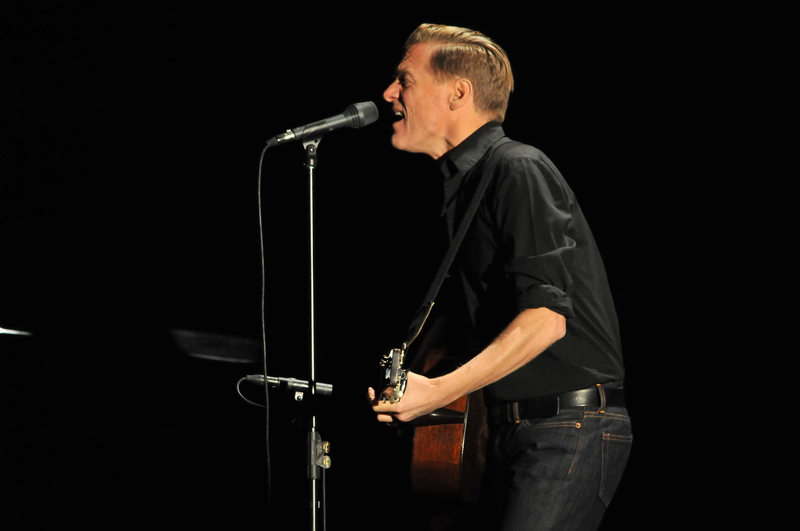 Bryan Adams brought his critically acclaimed “Bare Bones” tour to Buffalo before a near-capacity crowd at Shea’s. Adams walked on stage dressed in standard black T-shirt and jeans, but also wearing a top hat. From the opening chords of “Run to You,” the crowd was very much into it, singing and clapping along. Song requests were shouted out along with shouts of “I Love You Bryan” from several women (and even one man). As he stated early on, this tour is about stripping the songs down to their most basic level, the way they were written on acoustic guitar. Adams was accompanied by Gary Breit (who has worked with other fellow Canadians Kim Mitchell and Corey Hart) on piano for several songs. Just as Kenny Loggins can be called “the King of ‘80’s Soundtracks,” Adams can be called the same for the 90s. He talked about getting to sing with “one of the greatest singers in the world,” Barbra Streisand, on “I Finally Found Someone” from the Streisand-directed ‘The Mirror Has Two Faces.” (Everything I Do) I Do it for You, from Robin Hood: Prince of Thieves, brought the night’s first standing ovation. When introducing “All for Love” from “The Three Musketeers,” he mentioned how he got to sing with his idols Sting and Rod Stewart. On “Have You Ever Really Loved a Woman?” from Don Juan de Marco, Breit’s piano substituted for the Spanish guitar of the studio version. Adams called this his “prettiest” song as evidenced by the remarkable acoustics throughout the venue. With his trademark rasp, Adams has one of those voices you instantly recognize. This was my first time seeing him and at 54, he can still deliver. Adams’ connection with his fans was evident not just by the crowd interaction but a couple of nice gestures. He asked 2 people with a sign sitting in the last row of the balcony to come down to the front row and signed a young girl’s guitar. During the encore, everyone was encouraged to come down closer to the stage. Adams closed with his first Top Ten hit 1983s “Straight From The Heart” which he wrote when he was 18. This was a top notch show all around.